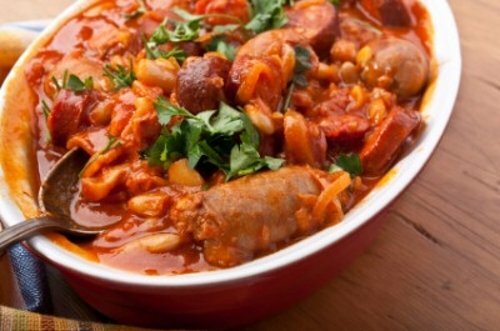 This hearty Sausage and Bean Stew is perfect any time of year but especially during the fall/winter seasons. It’s comforting and filling plus it makes the house smell good. I usually make this recipe a few times throughout the year using mild Italian sausage. You can use hot if you prefer. Just make sure you use a good quality store bought sausage because it is essential to the flavor of the dish. Just pick some up at your favorite Italian deli. Sausage and Bean Stew is an old country-style rustic Italian dish that of best served with a crusty loaf of Italian bread and a nice bottle of Chianti Classico Riserva Ducale Tradizionale. In a large frying pan cook the sausage until they are browned on all sides. Remove the sausage and drain on a paper towel. Sauté the onions, bell pepper, carrot, celery, zucchini and garlic until slightly tender. Around 2 to 3 minutes. Add the wine, tomatoes, cannelloni beans and beef broth. Season with rosemary, basil, oregano, salt and pepper. Cut the sausage into 1 to 2 inch pieces and add to the bean mixture. Lower the heat, over and simmer for 1 hour.